Thanks to Hans Brantz for this insight into the first volleyball teams to represent Queensland at a National Championships. 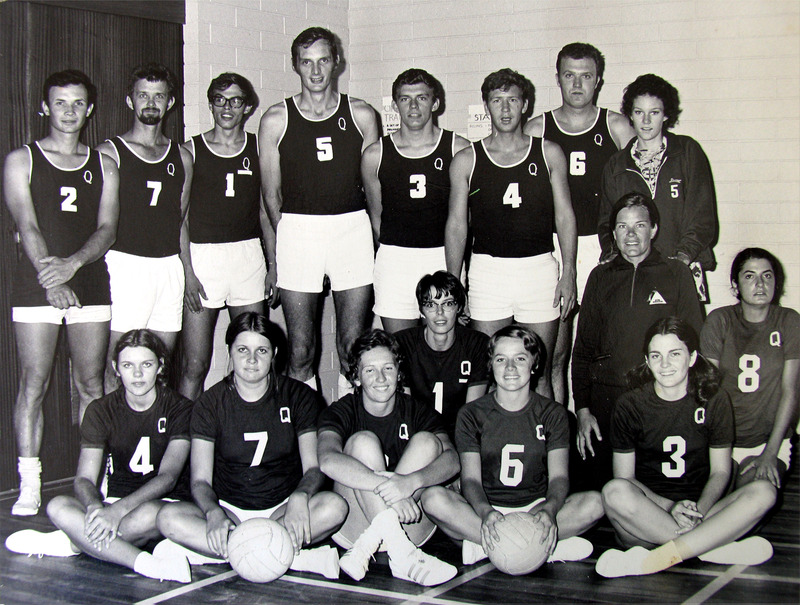 1971 was the first year Queensland was represented in the Australian Volleyball hampionships. We picked up enormous experience. A great handicap was that Janelle Wasley (one of our best players in the women’s team) sprained her ankle very early in the competition and we had to do without her. But most of all the interpretation of ball handling technique was different in Victoria (which at that time seemed to have a monopoly on the game) and Queensland was unduly penalised for “double hits”. This put both teams off balance, in particular the women’s team which had many newcomers to the game. It was to be noted that the teams were coached by very experienced people (Peter Monster and myself). Both of us had played representative volleyball in The Netherlands until only a few years before and were therefore well aware of the rules. It eased somewhat as the games progressed after Peter Monster and I strongly argued our case. The year after Victoria sported a very weird ball handling technique where the hands were turned sharply outward when playing the ball. This technique had been abandoned in The Netherlands in the mid fifties. However all this showed that to make progress, the refereeing was of utmost importance. We concentrated on this aspect. Through the year I qualified as Candidate International Referee and during the Sydney 1972 Championships I qualified and received my International Referees badge, the first in Queensland. Later we formed the Queensland Volleyball Referees Association. To become a member one had to sit for exams (theory and practical) to qualify and only qualified referees could umpire games at the fixtures which were played at Corinda High school at the time. Footnote: Career pressure forced me to greatly reduce my active role but it is good to see how Queensland Volleyball has progressed over the years. More Photos can be found on the Seniors Nationals 1971 & 1972 pages, courtesy of Hans Brantz. The latest updated for the Volleyball Queensland Rep Team site is all about National Seniors. Thanks to Wally Lebedew, former AVF Board Member, AVF Life Member and all round legend, who has kept records of all the Volleyball tournaments since their inception in the 60’s. Searching through the Library Resource in the Volleyball Queensland office, I stumbled across this piece of history, an insight into the beginnings of QVA, and QLD Representative teams. While completing teacher’s college Peter Marr was introduced to the game of Volleyball and became the first victim to be hooked on the sport in Queensland. Welcome to my site, a record of players that have represented Queensland over the many years. As the heading says, it’s a work in progress, and possibly a labour of love, but a fun project at the same. If you have any information to add, please send it to me, I hope to get as much info up here as possible.